Wow. Where did all the time go? Seems like only last week I was putting out the last column. My editorial duties at DVDTalk have been taking up more and more of my time, and though I still have a passion for silent film, I'm finding that I don't have as much time to write about it as I'd like. That doesn't mean the column is going away... anything but. There's a lot of silent film being released on DVD (and hopefully Blu-ray too) and I intend to continue my coverage of the era here at DVDTalk. The column might come out a little less frequently however, and feature the occasional guest reviewer. There are a couple of boxed sets coming out that will be of interest to silent film buffs. Kino is releasing Griffith Masterworks 2 on November 18th including the Avenging Conscience (1914) (along with the short Edgar Allan Poe (1909),) Way Down East (1920), Sally of the Sawdust (1925), and two sound films, Abraham Lincoln (1930) with The Struggle (1931). The set will also include a 1993 documentary on the director: D.W. Griffith: Father of Film. Not to be outdone, Flicker Alley is working on an impressive set of Douglas Fairbanks films. This set, Douglas Fairbanks: A Modern Musketeer, will contain eleven movies on five DVDs including the features When the Clouds Roll By, The Mollycoddle, The Mark of Zorro, and The Nut. This should be a fun set that will be out on December 2nd. Of all the film's about the American Civil War, one towers above the rest, with a meticulous attention to historical detail, the grace of a poet and the compositional precision of the immortal Matthew Brady's photographs that documented the era. The source, however, may come as a surprise. The film didn't come from the high-brow channels that churned out the beloved classic "Gone with the Wind" (1939), the controversial D.W. Griffith landmark "The Birth of a Nation" (1915) or recent favorites like "Glory" (1989) and "Gettysburg" (1993). It came from a silent slapstick comedian. More than 80 years after its release, Buster Keaton's "The General" remains one of the funniest, most exciting and mesmerizing films of all time. Even as new generations of filmgoers discover Keaton's subtle, deadpan work with fresh eyes and shift attention to other masterpieces like "Sherlock, Jr.," "The General" never loses its relevance or appeal. Hence the ongoing quest to release the ultimate version of the film on DVD. Kino International has upgraded its previous edition from "The Art of Buster Keaton" series to a great-looking new two-disc set, featuring a high-definition transfer from the original camera negative. 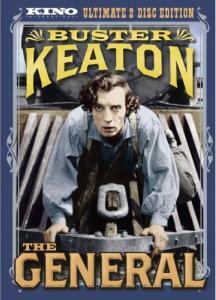 Keaton proudly attributed his film's accuracy to the decision to draw his plot not from a novel but actual history when he dramatized the Great Locomotive Chase of 1862. The event involved a group of Union raiders who stole a train in Georgia to disrupt the Western & Atlantic Railroad, a key to the Confederate army's supply line, only to be pursued by the train's conductor and two other men. Along with his gagmen, including co-director Clyde Bruckman, Keaton adapted the story and cast himself as the lone hero, engineer Johnny Gray, who fights the forces of fate by chasing down his stolen engine and proving himself to the woman he loves, Annabelle Lee (Marion Mack). Of course, on the way he has to contend with many comical obstacles, including a stubborn cannon, an abandoned train car that refuses to get out of his way, and the sobering fact that if he were to catch his train, he'd be greatly outnumbered--something that the Union soldiers luckily don't know. Throw aside the brilliant gags, the perfectly devised shots and Keaton the actor's ability to earn laughs from the smallest of gestures--Keaton's greatest accomplishments is that he turned an extended chase sequence into one of the most organic of all cinematic narratives. Nary a moment feels forced, drawn-out, or rushed. Every scene grows out of it predecessor and sets up the next one. The structure plays out with artful symmetry as the chaser becomes the chased and repays his antagonists for the trouble they caused him. Even Keaton's riffs on filmmaking conventions are placed as well as any other filmmaker could place the conventions he's referencing. As Johnny hides under a table in a house occupied by Union soldiers, he discovers that Annabelle Lee was kidnapped in the robbery. When he sees her through a hole in a table cloth, the hole stands in for a by-then out-of-fashion iris, framing her face in a circle. This faux-iris comes in the same dramatic moment for which D.W. Griffith might have used an actual iris shot while making one of his high-class dramas five or 10 years earlier. Two of the film's most iconic shots illustrate Keaton's range as a filmmaker. In one, he sits forlorn and motionless on his engine's driving bar, after his love unfairly rejects him. The train starts moving, but he's too sad to notice, and sits still and aloof as the train accelerates, looping him up and down. The other, an astounding train wreck, was the most expensive shot of the silent era, yet presents itself with an ironic matter-of-factness to mock a self-assured villain. Notably, neither of these shots illustrate Keaton's remarkable gifts as a physical comedian, but instead showcase his impeccable understanding of timing and visual language. No idea was too small or too grand for Keaton, as long as he could milk a laugh from it and keep his audience engaged in the story. Kino's new HD transfer is finely detailed and captures the beauty of the sepia-toned print like no other previous edition. Only the black-and-white 2004 French edition by MK2, which was restored a frame at a time to remove scratches and decay that still exist in the Kino version, surpasses it. While the added detail is welcome (an HD release would be more than welcome), the age of the source material still shows. The imperfections, while minimal compared to many silent releases, are nevertheless noticeable throughout the film, and mar what could have been an image of exquisite quality. Also, while the sepia tone often works to great effect, the blue tinting in the nighttime scenes tends to remove detail. Kino earns brownie points for the inclusion of three different scores for the film. Most importantly, the new disc marks the first time that Carl Davis's well-loved 1987 orchestral score, composed for Thames Silents on UK TV, has been released in the US on DVD. (Thanks to the two alert readers who pointed out that it was released in the US on laser disc.) Davis crafted a score that matches the drama brilliantly and keeps up with the film's comedic pace, and it sounds great in the new 5.1 Stereo Surround track. The disc also includes a theater organ score by Lee Erwin and the the ubiquitous Robert Israel arrangement, both of which sound very good considering the source material. The bonus disc includes about 45 minutes worth of extra features, including three new featurettes. John Bengston, an investigative film historian who tracked down Keaton's shooting locations for his book Silent Echoes, gives a brief and enlightening tour of shooting locations in Cottage Grove, Oregon as they were then and as they are now. The longest segment, hosted by an expert from the Southern Museum, provides a tour of the actual General from the Great Locomotive Chase, with details on the historical event, and a demonstration of the inner-workings of the train. While the segment offers no insight into the film itself, it may be of interest to history buffs and those who wish to compare the true story to Keaton's version. Finally, "The Buster Express" offers a fun, five-and-a-half minute free-association montage of Keaton's many gags involving trains. A minute's worth of behind-the-scenes home movie footage of the filmmaking process has value, but Kino could have greatly increased that value by meaningfully editing together with clips from the film and adding a voiceover to explain it. There are also two celebrity-hosted introductions from television airings of the film. Orson Welles offers an introduction that only Orson Welles could deliver. It's at times insightful and astute, at times suspect (did Welles really meet Keaton while he was a dishwasher, or did Welles just think it sounded good?) and always comedically Wellesian. The Gloria Swanson introduction is dated, much shorter, and much less informative, but might amuse some looking for campy fun. Finally, Kino includes a gallery of promotional photos, lobby cards from various countries and production stills, including material from a sequence that was deleted from the film's final cut. It would have been nice if Kino included "Cops" and "The Playhouse," so that owners of the company's previous edition could discard the old one, but I suppose Keaton-lovers will just have to keep two to five editions of "The General" on the shelf, depending on which scores they like best. There have been a lot of quality editions of "The General" in recent years, most notably the Mont Alto Motion Picture Orchestra's Private Reserve release and MK2's nearly insurmountable restoration, which features Joe Hisaishi's new score (as well as Israel's). MK2 did Kino no favors by executing a full frame-by-frame cleanup that repaired any damage and decay on its own HD transfer. Lucky for Kino, that version is currently only available in Europe and Australia (unless you've heard of the Internets). Kino's new release wins out as the best U.S. release and the best tinted transfer to grace Keaton's masterpiece. (Another thing to consider: the MK2 edition is black-and-white whereas this edition is tinted, if you have a preference.) And to finally have access to Davis's lovely score is equally exciting. If you love "The General," you'll definitely want this edition in your collection. If you're unfamiliar with Keaton, you ought to get acquainted with one of true filmmaking geniuses. This is a good place to start. Read more of Jeremy Mathews' reviews and musings at The Same Dame.